The struggle for the working class to survive through generations of deprivation demonstrates an intellect and an ability to learn new skills. Without doubt, many lesser intellects could not have survived and adapted. But this has rarely been enough to escape from poverty, since the route to escape a life of long hours of toil working below ground or in factories needed skills and qualifications and an education which, to the rich and privileged, was exclusive to themselves, and begrudgingly for the middle classes whose votes they depended on. For the working class, the route out of poverty was education. To the son or daughter of a miner, an education was the passport to another life. For working class children, prior to WW2, the best hope of an education which might lead to an escape from poverty was a scholarship to a grammar school. My mother often talked of the dreams she had, but despite such a scholarship, these were never realised because of the prohibitive cost of a school uniform. Like many young men at the beginning of the war, at sixteen, my father, son of a Welsh miner, squandered his grammar school chance, by throwing it away to join his brothers in the war, months before his matriculation which was the equivalent of O Levels. It was not just the working class who knew things needed to change. It had been clear that there was a shortage of skills during the war, and this led to the 1944 Education Act 5) which led to the provision of free state education for all children from 5 -15. Had Attlee’s government made the brave decision to solve the problem of private and Church schools, and introduced a free universal education system for all, and eradicated private education, I believe it would have led to a fairer, and much more settled system which would have benefited all as the NHS has done. The socialist dream of equal educational opportunities for all children was never to happen, and once the impetus of the post-war rebuilding effort was lost, no future Labour government was ever radical or brave enough to address this. Furthermore, successive post war governments continually inflicted so much damage by repeated and unnecessary changes using education as a political tool. My parents’ choice for their daughters was a local post-war purpose-built comprehensive school. Unlike grammar schools, these schools would be open to everyone and offer the same opportunities and more. Cities such as Birmingham, London and Coventry were introducing these new schools with success; they were well funded, and had amazing resources. Grammar schools received three times the funding of secondary modern schools which had poor resources, and could not offer the same opportunities. Most towns and cities did not have any of these new comprehensives, and so for 70-80% of children who did not pass the eleven-plus, life’s opportunities were diminished. Opportunities for girls were even rarer since a girl would have to score more highly than boys in the Eleven-Plus to achieve a place in a grammar school. Click on the image above, for an archived BBC video clip which shows the new optimism of comprehensive schools, and the belief that the privileges from public schools would come to an end. Surprisingly, further development of the new comprehensive schools was due to disgruntled middle class conservative voters who could not get places for their children in what they perceived as their very own grammar schools, so resulting in the Tories losing power in 1964. This is something which Margaret Thatcher, while an advocate of the grammar schools, was well aware of. The Newsome report 6) entitled “Half our Children”, published in 1963, recognised the eleven-plus failure and a drive towards a more comprehensive system was subsequently planned. Comprehensive schools can never be truly comprehensive where other selective systems exist, whether this is a neighbouring grammar school, a grant maintained school, faith schools, or private schools. Since this has always been the case, inequality has remained. Parents have seen other children receiving what they saw as a better education in schools with smaller classes. Understandably, and quite rightly, they wanted the same chances for their children, and so it has led to decades of changes from governments with promises. Indeed, Tony Blair, Harriet Harman and even Diane Abbott did not choose to send their own children to local comprehensives and the hypocrisy was not lost on the electorate. Meanwhile, David Cameron and George Osborne with their Eton, pompous, out-of-touch education 14) certainly don’t understand – or care. It is the promise of a vote of an disatisfied parent which has led to governments to use education as a political football, while never really reaching the goal. It is a fact that countries with the highest social mobility, the Nordic countries and Canada, have genuine and well-established comprehensive education systems. Furthermore, genuinely non-selective education systems routinely top the world league tables. (1) We might ask, if comprehensive education is so successful in improving opportunities, why and when did it begin to be unpopular in Britain, and why has it been presented by the media as failing, so that most schools in England will now be replaced by something called an Academy, whatever that is. We have never known a genuine comprehensive system in Britain, despite glimpses of what can be possible in excellent schools. During the long Conservative years, state education was so deprived of resources. Teachers, parents and children will remember how schools had no text books and buildings were literally falling apart. So, I, one of many, remember the excitement in 1997 that the Conservative party were finally beaten at the General Election and the words “Education, Education, Education” and “Things can only get better” echoed the promise and the hope that a fair society was on its way. I have to say, things did get better. Schools were rebuilt, books provide and investment was ensured. All that was welcome. But somewhere then, it started to go wrong. Towards the destruction of State Education as we know it. Excessive control of education by Whitehall became rigid, prescriptive, so removing professional freedom for teachers. Schools need to be accountable, that I do not deny. However, the publication of League Tables has done more harm to our education system than any other intervention I can think of. Eventually schools were no longer about the needs of children, but about the needs to be in a higher position of the league tables, which for politicians could be manipulated. Like football tables, children and schools below the mean would be regarded as failures. This of course suggested that half of all children would be destined to fail. Such meaningless and unhelpful competition destroyed the morale and professionalism of teachers who no longer taught but ‘read from the script’. It was no longer about educational success, it was about failure. Disatisfaction resulting from a position on a league table of academic performance of a school, led to the idea of a need for choice. To state the obvious: What choice can a family on a joint income of £20,000 or less exercise to apply for a school that charges £12,000 a year? How many families know of the existence of the shadowy world of tutoring that powers children into the highly selective grammars (and private schools) dotted around our major towns and cities? The myth of choice reinforced and extended social divisions caused by unfair education rather than addressing them. New Labour, like Attlee’s government before them, had missed a wonderful opportunity to provide a truly, universal and comprehensive system by removing the selective grammar schools, faith schools and private schools. People became convinced that a comprehensive system could not and did not work. Massive cuts inflicted by the coalition government on local authority schools and services certainly made it difficult for many good schools to continue with the status quo. This led to pressures to change the system. It has led to the privatisation of our schools,and will result in a two -or three- tier education system, reinforcing the very injustices from class division which the Labour Party was set up to eradicate. Schools have become competitors within a marketplace. Perhaps it is because British working people have never held our comprehensive education system in such high esteem as they have the NHS, that it has been relatively easy to implement a plan which will lead to a total destruction of state education as we know it. While New Labour’s Academy policy stated an intention to improve underachieving schools, it failed to address why such schools underachieved in the first place. Destined to become one Academy the Upper Schools (secondary moderns) in Buckinghamshire underachieved because grammar schools still existed in the area. (1) That results were skewed by the continued existence of the eleven-plus was ignored when justifications for interventions were made. Gove’s Academy Schools and Free Schools which are being set up by the Coaltion differ from the Academies of New Labour. Despite any lack of evidence, Anti-Academy Alliance (7), Local Schools Network (17) ( and indeed some to the contrary) that Academy Schools improved children’s attainment, conversion of schools to Academy status been pursued relentlessly, because of the intent to remove democratic control and to facilitate privatisation, and to allow tax breaks for sponsorship of charitable trust schools, (charity clearly beginning at home). Where Academies have been unpopular to parents and staff, they have been forced through regardless. In fact, they are the products of bribery and corruption – schools needing to go through this process to achieve extra funding, that funding being creamed off from Local Authority centralised services, which Academies would have to buy into in order to access. The extra money will decline over successive years, and has been offered to schools who would did not know their future costs. Head-teachers were offered inflated salaries to support Academisation. And so, there was a domino effect of Academisation. As one school converted to Academy status, pressures were put on other secondary schools to follow, such that the situation is now that the vast majority of secondary schools have converted to an Academy – which, if you are still wondering, is a school which is independent of any local authority or democratically elected accountability. Such schools have no responsibility to monitor attendance. They no longer work alongside their neighbourhood schools and share a centralised support network, unless they are ready to buy in that support. Weaker schools will suffer because of the break-up of the local authority network. TES (3). Rather than working together, schools are competitors in a market-place, teachers paid by results Guardian (4) , and with an end to national pay scales the rift can only widen. Independent 20). There are now plans underway to academise central services such as pupil referral units, and this is to ensure that there is no perverse incentive, that local authority services are not advantaged by public funds from competing with private providers ready to sell their wares and profiteer from assets paid for by the public purse. Already some underspent funds from Academy schools have found their ways into offshore accounts. Last year Stanley Fink’s “education company”, Ark Schools, underspent 7.5% of the education budget for the 8 schools he controls and they are investing the money in the Cayman Islands instead (money that was meant to be spent on children’s education) and he’s not alone, as Open Democracy 11) reports. The conversion to Academies has taken place in the majority of secondary schools, and those remaining in local authority control are faced with surviving without the centralised support they have depended on, or to alternatively follow the others to academisation. So, Gove and the Coalition are now concentrating on a drive to academise primary schools, and then no doubt Early Years will follow. In May 2012, the people of Birmingham clearly voted Labour and against the Coalition decisively. Yet Birmingham primary schools are under threat. Campaigns have been organised across the country. Downhills School in London, In Birmingham parents and staff at Bournville school successfully prevent their school from becoming an academy. The Anti Academies Alliance (8) is producing a newspaper to distribute at the schools. If you are a parent or staff member at the school, or are able to help distribute newspapers and leaflets at a primary school in Birmingham, please contact the AAA on office@antiacademies.org.uk or 07528 201 697. Bousted said that in a “vastly unequal society”, only the brightest pupils would escape the lasting effects of inequality. Such social divisions caused by the education divide will be reinforced, and begin even earlier as primary schools will be encouraged, or even forced in a particular direction. With the establishment of more and more federations and school chains, certain primaries will become known as feeders for particular secondary schools and the battle of schools choice will begin in earnest at nursery. So, how can we trust David Cameron, who stated in 2007 that he is opposed to selection at eleven, yet now supports selection at three? 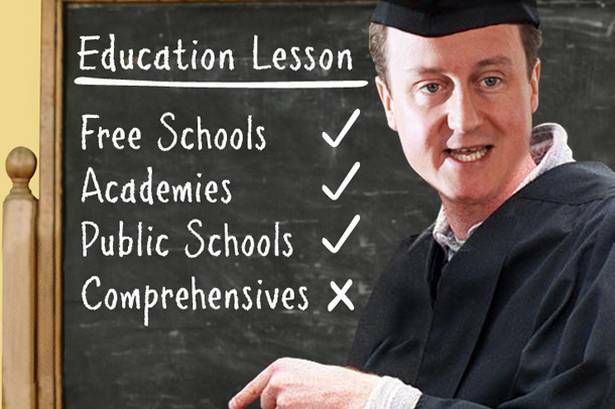 He and his government have no shame in inflicting damage to our children’s education. Where is the shame from causing this damage because of political, ideological purposes, involving covert conflicts of interests of contributors to the conservative party? Children are no longer regarded as a future citizens who need to be prepared for fulfilling lives, contributing to society. Children, their education, health and our future are a source of profit. Overcoming the media to inform people of huge changes quietly being made behind the scenes which will have devastating effects on their lives, and those of their children has always been the major obstacle facing Labour. Forces opening doors for privatisation were not just in opposition parties but infiltrated the political parties of the Left, so it is unsurprising that ordinary people in despair now feel betrayed by the Coalition and “New” Labour as the NHS, our state education system, care of the elderly, and our democratic system are snatched away. The tide is turning as people awaken from the soporific, anaesthetic effects of our dull media, and turn back to Labour to fight this onslaught from the coalition and save the infrastructure of our society before it is too late. Labour must oppose privatisation of our state education system, and Gove’s destructive policies on Academisation, free-schools, and the social engineering by pricing out ordinary people from tertiary education which is underway. Labour must also develop policies which provide an excellent and truly universal education system which provides quality education for all, focusing on children’s needs and not New Labour’s endless arbitrary targets. Achieving true equality of opportunity and fairness in education can only be achieved when socialist Labour presents the policies needed when the opportunity comes around again. Atlee and Blair missed that chance. Future Labour governments must not. Why do we need Academies? 4. Guardian– Markets can’t magic up good teachers – nor bonuses. 7. 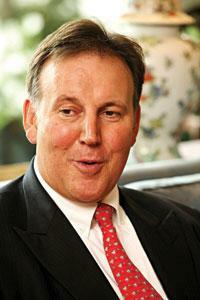 Anti Academy Alliance: Are Academies Proven to succeed? 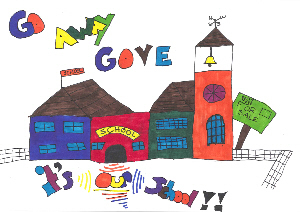 16 Hands Off Our School: Converter Academies Beware! This entry was posted in Economics, Education, Party Organisation, Policy Documentation and tagged academies, Class division, comprehensive, Education, eleven plus, grammar, Labour Party, Michael Gove by Pamplemousse. Bookmark the permalink. Good article – I too have read ‘School wars’ and agree with most offered here, but am not convinced that Labour can be the saviour since it was Labour’s Andrew Adonis who spent years rolling out the Academies. His book ‘Education, Education, Education’ glossed over the merit of the euphemistically named ‘sponsors’, happy to extol the passion of Reg Vardy, for example, now engaged in running schools for which it was assumed he had good training by virtue of his ability to run a car sales business. The Alliance continued where he left off, and with even greater gusto, but in the same direction he set.